Hear that sound? That is the sound of Whakapirau. A quiet and relaxing place for you and your family. 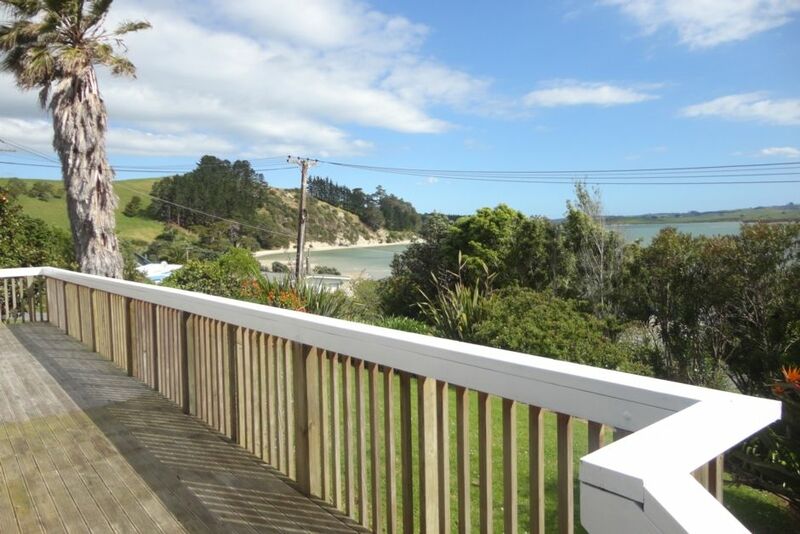 Come and relax on the spacious deck and enjoy the sun, Kaipara Harbour views, and looking across the water to Pahi. There is plenty of on-site parking and room for a tent on the large section out the back, or a kids tent right outside the ranch slider. Send Dad and the kids down to the Whakapirau Wharf to catch dinner. It is only a 5 minute walk away. You also have the option of launching your boat from the beach. You will be able to cook your freshly caught fish, or own sausages, on the BBQ while enjoying a glass of bubbles. The house is 30 metres from the sandy / shelly beach where your children can splash safely. Local tennis court, basketball hoop, petanque court and tree swing for the kids to enjoy. Guests were easy to communicate with. They left the house clean and tidy and followed all instructions. A pleasure to have such a family stay in our piece of paradise. Would be happy to have them stay again. Lovely views. So relaxing. Great, clean bach. We thoroughly enjoyed out stay here and keen to come back again and explore more of the Kaipara. This was our third consecutive January visit. My sons and I had a wonderful time. We enjoyed the peace and tranquilty, fishing, tennis, rope swings and swimming. The proximity to Waipu Cove, Mangawhai and Whangarei made day trips easy. The bach is clean and has everything we could possibly have needed. Stephanie is great to communicate with. We are hoping to stay again. This is the third year this family has stayed at our beach house. They are extremely thoughtful and responsible and treat the home like their own. The house is always left clean and tidy, all procedures are followed. It is easy to keep in touch with this family throughout the renting process. I have no hesitation in allowing them to stay anytime as I know they appreciate what our house and area have to offer. The best place to relax while watching the tides come in and out, and the bunnies scampering about. Lovely large decks to sit on and read or sunbathe, close to the beach for a swim. What more do you need. Thanks for letting us stay. So happy to rent our piece of paradise to this family. The house was left in spotless condition, instructions followed. It was easy to communicate with this family right from mid year when it was booked. Family welcome to stay anytime. Thank you for looking after our home. Great little property with great views! All the things you need in a holiday bach! Our house was left clean and tidy. Communication was easy. It was a pleasure having this family stay, for the second time. They left our house clean and tidy and all instructions followed correctly regarding power, return of key etc. It was easy to communicate with the family.